College Nine, founded at UC Santa Cruz in fall 2000, celebrates its 10th anniversary the weekend of May 13-15 with a multitude of events including "Peace on Fire: Global Blues, Poetry, & Politics," a spoken-word and live music performance featuring Angela Davis, Corey Harris, Ekua Omosupe, and Shailja Patel on Saturday, May 14 at Kuumbwa Jazz Center in Santa Cruz. Details are available at collegenine.ucsc.edu/news/alumni/. College Nine opened with the theme of international and global perspectives and a close association with the Division of Social Sciences. Professor Helen Shapiro, provost since 2006, said the anniversary is a chance to celebrate the uniqueness of College Nine and everything it has accomplished in its first 10 years. "It is also an opportunity to highlight and celebrate the continuing importance of the colleges at UC Santa Cruz," Shapiro said. Anniversary events kick off with the screening at 7 p.m. Tuesday, April 26, of "Will the Real Terrorist Please Stand Up," a new documentary film by acclaimed filmmaker Saul Landau. The film tells the story of five Cuban intelligence agents now imprisoned in the United States who infiltrated Miami-area groups plotting against their homeland. The screening is at the Colleges Nine and Ten multipurpose room and will be followed by Landau's comments and a question-answer session. 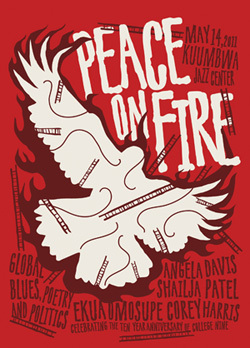 Saturday night, May 14, "Peace on Fire," an event for the community, takes place at Kuumbwa Jazz Center. Doors open at 7 p.m.; the event begins at 8 p.m. All proceeds benefit the College Nine Book Fund, established in honor of the 10-year anniversary. The fund provides textbooks for low-income students. Tickets are $25 or $50 for VIP "Gold Circle" admission that includes entrance, a brief and informal meet-and-greet with the performers after the event, wine and cheese reception, and a signed commemorative poster. Tickets are available at Streetlight Records in Santa Cruz and online at inticketing.com. Headlining the evening is UC Santa Cruz professor emerita Angela Davis, for whom a residential house at College Nine is named. Also appearing will be Shailja Patel, a poet, playwright, and activist, born in Kenya, who now splits her time between Nairobi and Berkeley; Ekua Omosupe, a Cabrillo College English instructor who received her M.A. and Ph.D degrees in literature from UCSC; and Corey Harris, a delta blues and reggae musician, who has attracted a wide following. He was named a MacArthur Fellow in 2007.